I work as both a cinematographer and a director/cinematographer; I find the latter to be especially challenging. I need to be able to have the tools I feel most comfortable with, physically and technically, since my mind is working on lots of things at a time—not just what’s happening in the picture. I prefer to work with small crews. The part of my job I hate the most is carrying stuff, so I’ve figured out a setup that works for me on most films, where I have as little as possible. There are two things I cannot live without on a shoot. One is a padded camera strap. This strap costs about $20 and serves so many great purposes. When filming vérité, sometimes I use the strap as an extra way to stabilize the camera on my body. If I need to put the camera down and have a conversation with someone, take notes, etc., it frees up my hands to do whatever I need. I use the strap to carry it on my shoulder. It also lets my hands rest, even if there’s not a good spot or moment to put the camera down. I can also get the camera up a second faster if something unexpectedly starts to happen. The last advantage: You can eat a slice of pizza or a sandwich without having to put the camera down anywhere, which, sadly, is how I often eat lunch—standing with a camera on my shoulder, scarfing down some unhealthy food. 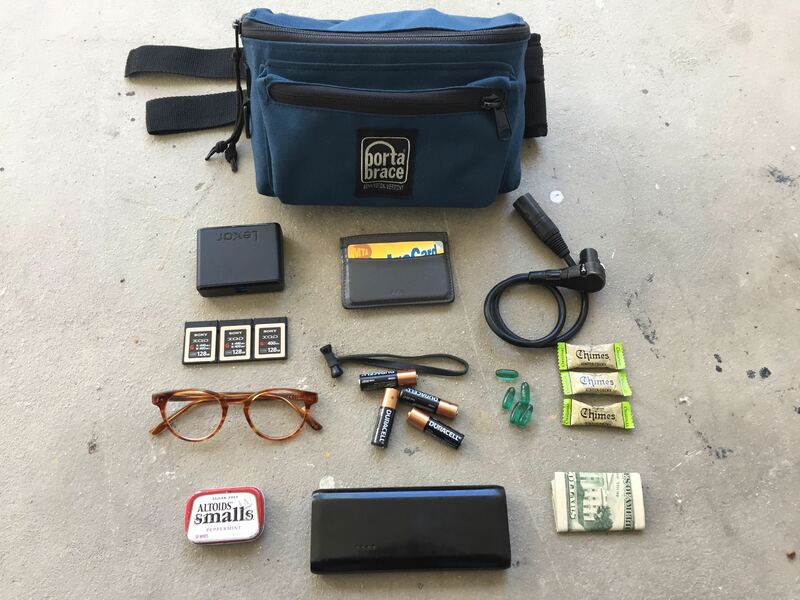 The second essential item is a Portabrace waist pack, which changed my life; I paid about $80 for it. The pack has a hard top that I can rest the camera on if I’m shooting from the hip, which is often. It’s so comfortable that I can film like that for hours without getting tired, or without causing a visible shake in my footage. I can move fluidly, so my motion looks natural. Plus, you have a place to put your personal stuff, extra batteries and cards. I hate having anything in my pockets when I shoot, and I have often found myself separated from my crew with no phone, money or ID. The waist pack helps me keep what I need with me without being uncomfortable. I mostly shoot vérité films, and the go-to lenses I have in my kit are the Canon 16-35 and 24-105 with image stabilizer. I find I’m pretty well covered with these two lenses for most vérité situations. I like to shoot landscapes wide, so 16-35 handles that, but if I want any details, the 24-105 can often do the trick. I have one prime lens that I own: a Sigma 50mm Art lens 1.4. I wanted a 50mm prime, and I felt this was a great option for the price. I use it often, and am really happy with it. I'm obsessed with organization, for the fear of forgetting something, so I put everything in the exact same place every time I go out on a shoot. Personal items: Advil for neck pain; ginger candy, ginger pills and Dramamine for nausea. Sometimes when I stare in the viewfinder too long in a moving car, or if there’s a surprise boat ride, or I'm forced to eat some gross food on set (which happens often), I get nausea. So I'm covered. The last thing I want is to be sick on a shoot. Nadia Hallgren is an award-winning filmmaker and director of photography from The Bronx, New York. With a focus on vérité storytelling, her cinematography credits include the Sundance award-winner Motherland (2017), Academy Award-nominated and Sundance Grand Jury Prize-winner Trouble the Water (2008), and Sundance award-winner Trapped (2016).